Toddlers love water. As a parent, you can either see this interest as an “uh oh” waiting to happen or you can embrace it and turn it into a teachable moment. Toddlers' natural curiosity about what is going on in the world makes them perfect little scientists. As parents we just have to be a little creative in finding experiences that are fun, cheap, and meaningful. 1. Exploring Bubbles: On your kitchen floor or another hard surface, put down a towel. Next fill a large plastic mixing bowl halfway (or less) with warm water. Then add some non-toxic dish soap and allow your toddler to explore the soapy water mixture. Add some platic containers, toys, a sponge or a washcloth. 2. Experimenting with Pouring: Fill a large storage container with water. Add cups of different sizes and other containers, such as empty plastic food containers. Allow your little one to pour water from one container to another. This can also be done in the tub. 3. 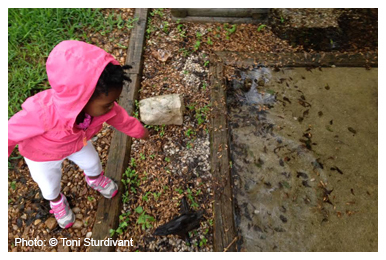 Observing Rain: There's so much to learn and explore outside. Luckily, rain does not have to be a reason to stay in the house, as long as there are towels and dry clothes to change into. On a warm rainy day allow your toddler to go outside and explore the rain. Vocabulary to introduce: wet, rain, sky, cloud, raindrop, puddle, rainbow. Keeping your toddler entertained and learning will be a little easier with these three activities. Can you think of other exciting ways to incorporate science into your child’s play? Toni Sturdivant, MA is a mother of two and a master teacher for the Pre-K 4 SA initiative in San Antonio, TX.